From 8 – 13 July 2014, Jordans Cereals is unveiling ‘The Jordans Wildlife Garden’ at the RHS Hampton Court Palace Flower Show. It has been created by award winning garden designer, Selina Botham, to reflect a long-term commitment from Jordans to the British countryside. As part of the countryside celebrations, Jordans has enlisted the taste expertise of Great British Bake Off winner, Edd Kimber, to create a series of foraged food recipes inspired by The Jordans Wildlife Garden. The range of three exciting new recipes: Mixed Berry Traybake with Rosehip Syrup, Cherry Plum Crumble with Cobnuts and the Alpine Strawberry Fool. 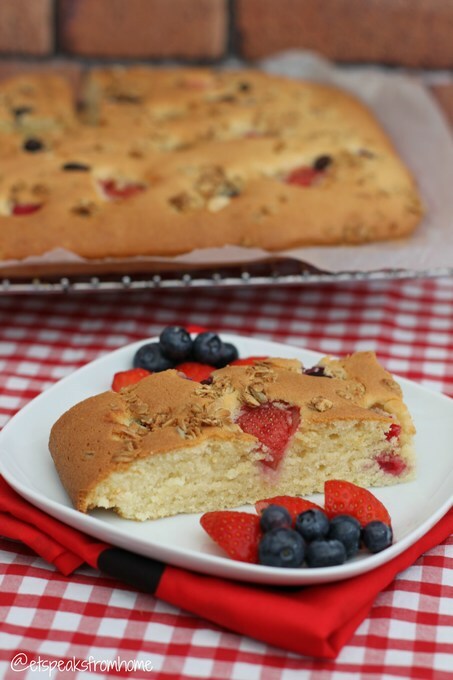 I chose to bake the Mixed Berry Traybake recipe but didn’t use the Rosehip syrup for dressing. This recipe is kindly provided by Jordans. This recipe is easy to make but it takes a long time to prepare. I think if I had a proper mixer, I might have been able to cut down the preparation time. Also I didn’t use all 200g of mixed berries and Jordans’ granola. As my tray is slightly small, I only used a handful of ingredients. It still looks perfect! Also I had cut down the recommended cooking time to 30 minutes as it looked ready. I would highly recommend you try this recipe as it is gorgeous! Very soft and delicious. For the traybake, grease a deep 9×13 rectangular baking tin and line with a strip of parchment paper, leaving about a 2-inch overhang along the long sides. This will make removing the cake a lot easier later on. Preheat the oven to 180°C, fan oven 160°C, Gas Mark 4. For the sponge mixture, place the butter and sugar into a large bowl and using an electric mixer beat until light and fluffy, for about five minutes. Mix in the vanilla extract and then one at a time beat in the eggs, beating each egg until fully combined before adding the next. Mix the flour and baking powder together and then in three additions add to the egg mixture, mixing until just combined. Add the milk and mix to combine. Scrape the batter into the prepared tin and spread into an even layer. 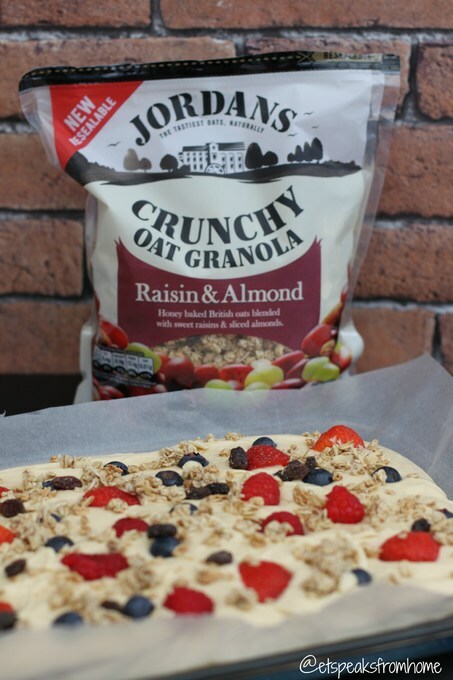 Scatter over the berries and Jordans Super Berry Granola and bake in the preheated oven for about 40 minutes until golden brown, or when a toothpick inserted into the middle of the sponge comes out clean. Allow the cake to cool in the tin before drizzling with the rosehip syrup. If you want to add a bit of decoration to the traybake you can mix 75g icing sugar with the juice of 1/2 lemon, until you have a smooth, just pourable mixture. You can also add a couple of teaspoons of rosehip syrup to this if you like. Drizzle over the sponge to give a lovely finish to the cake. For the syrup, place 2 litres of the water into a large saucepan and bring to the boil. Whilst coming to temperature, roughly chop the rosehips. This can be done by hand or in a food processor. When the water is at a boil, add the rosehips to the pan and bring back to the boil. Reduce the heat and simmer for 15 minutes. Remove the pan from the heat and cover, allowing to infuse for half an hour. Line a colander with muslin and place over a large bowl. Pour the rosehip mixture into the muslin and allow to drain for an hour. Bring one litre of water to the boil and add in the rosehip pulp from the colander, bringing back to the boil and then simmering for another 15 minutes. Remove from the heat and again allow to infuse for half an hour before pouring back into the colander to drain. Once all the liquid has drained through, discard the pulp. Pour the rosehip liquid into the pan along with the sugar and bring to the boil, then reduce the heat slightly and boil gently for about 5-10 minutes until reduced and syrupy. Pour the syrup into sterilised bottles and seal. Disclosure: We have received the product to do this bake. Recipe use with permission.